Picture this: two pillars of light stretching from the ground up to the heavens, penetrating the nighttime darkness. It’s the annual “Tribute in Light” held in New York City every September 11. It’s a stirring sight and a beautiful memorial to the victims of the 9/11 attacks and the unbreakable spirit of New York. Comprised of 88 spotlights arrayed in two 48-foot squares pointing straight into the sky, the towers of light are visible in a 60-mile radius around lower Manhattan. The light towers, however, also play havoc with migrating birds, messing with their internal navigation systems. Confused by the lights, thousands of birds would get stuck in a holding pattern, flying in circles around the lights until they fell out of the sky from exhaustion. Researchers noticed this phenomenon and devised a simple solution: turning off the lights for a few minutes. After just a few minutes, the birds could reorient themselves and fly away. Now NYC Audubon Society volunteers monitor the 9/11 tribute. Every time 1,000 birds or more are observed circling the lights or an exhausted bird falls down, the lights are turned off for 20 minutes. The 9/11 tribute, with its 88 spotlights aiming a combined 616,000 watts directly into the sky, is an extreme example of light pollution. It’s only one night a year and it’s been made safe for birds, so it’s not a big deal. But what about all the other lights that are on every night, all year long, also throwing light into the sky? Light pollution is a big problem for both animals and people and it is most apparent in cities. Turning the night into day with bright lights impacts nocturnal animals—especially prey animals that use the darkness to hide from predators—as well as birds who use the moon for navigation. Even baby sea turtles are not immune; they hatch on beaches at night and they find the sea by looking for the bright starlit horizon over the ocean. Artificial lights draw them inland to their deaths. For humans, aside from losing out on the wonders of a natural nighttime light show that is the Milky Way Galaxy, light pollution really hits our collective wallets. 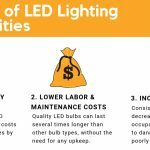 The International Dark-Sky Association (IDA) estimates that 30 percent of outdoor lighting in the U.S. is wasted and that squandered light costs $3.3 billion in energy. In addition, the energy production for all that light releases 21 million tons of CO2 into the atmosphere annually—an amount that would require 875 million trees planted each year to offset. The solution that would save the U.S. $3.3 billion, protect the atmosphere, and keep the baby turtles alive is simple: dark sky lighting. Dark sky lighting is exterior lighting that is fully shielded on the top and all sides, so the light is directed down to the ground, rather than to the sides or the sky. It is dimmed to be no brighter than necessary. The first step in ensuring dark-sky compliance with exterior lighting is shielding it. Shielding the light source prevents glare, making it safer for pedestrians and drivers alike, while also creating a more comfortable experience for our eyes. Shielding is especially important with light bulbs. Most light sources consist of some sort of spherical bulb, which throws light in every direction. This is wasted light. Some fixtures reduce the wasted light with reflectors around the bulb, but a better solution is a light source that only shines down. 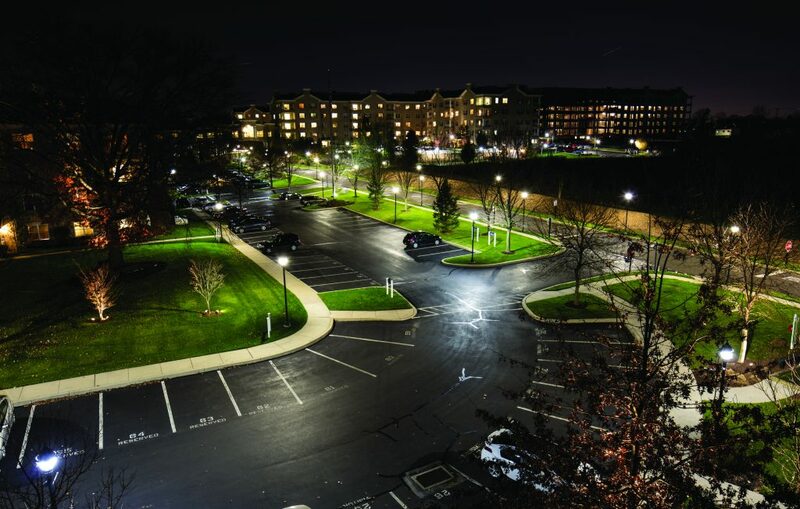 For example, Amerlux’s Avista LED retrofit product consists of LEDs arrayed on a disc parallel to the ground. 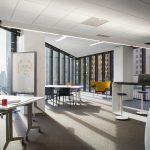 The Avista design allows a lower wattage light source to light only the ground with the same or better-quality light as a light bulb and without any of the light polluting side effects that a light bulb would bring. Across the pond in the U.K. city of Manchester, motion sensors dim the lights in unused areas, while upping the light output in busy areas for energy savings. Copenhagen, Denmark took the idea further by combining energy efficiency with bicycle safety. The city added sensors to the streetlights to detect cyclists and turn up the lights when cyclists ride down the streets. Dark sky-friendly lighting is simply the right amount of light in the right place at the time. It’s a win-win for communities and the environment, saving huge sums of money and keeping the skies clear so we can enjoy the stars. 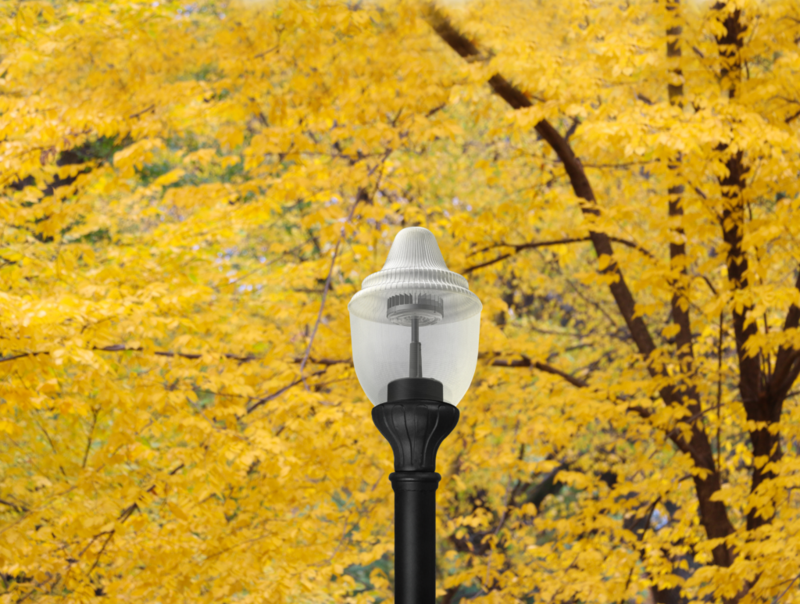 Discover how you can use the Avista LED pedestrian light to darken your night skies and cut energy costs by 75 percent!